Now imagine a mountaintop removal operation, which blasts the top off the Penokee Hills to extract a low-grade iron ore deposit hundreds of feet below. This would create the largest open pit iron mine in the world, some 4 miles long by l.5 miles wide and 1000 feet deep. Over a billion tons of waste rock and tailings created during the projected 35-year life of the mine would be dumped at the headwaters of the Bad River watershed where it could leach toxic metals into the largest undeveloped wetland complex in the upper Great Lakes. Seventy-one miles of rivers and intermittent streams flow through the proposed mining area, emptying into the Bad River and then into Lake Superior. During Governor Scott Walker’s 2013 State of the State address he brought out the state flag and pointed to the image of the miner on the flag and proclaimed that Wisconsin is a mining state. “If any state can move forward with a way to streamline the process for safe and environmentally sound mining, shouldn’t it be the Badger State?” Walker has proclaimed that his proposal is all about creating jobs. But his campaign received about $11 million from mining interests and Walker met with Gogebic lobbyists to draft an iron mining bill immediately after taking office in January 2011. Walker’s evocation of “badgers” mining the state in its early days omits the fact that this was often made possible by the dispossession and impoverishment of the Native Americans who occupied mineral-rich lands before Wisconsin became a state. With the passage and signing of this new iron mining bill, Wisconsin begins the latest round in this long history of extracting natural resources from the lands of tribal people. For more than a century, these tribes lacked the legal power to fight the state. But in recent decades tribal groups, often allied with environmental groups and local officials concerned about the impact on tourism, have been able to defeat the mining interests. Tribal groups have become the most important protectors of water quality in Lake Superior region, and are likely to fight this new mine in the courts as well. Ultimately, Lake Superior Ojibwe leaders had to sign treaties giving up their ownership of lands including the rich copper deposits of the Keweenaw copper districts of the Upper Peninsula of Michigan and the extensive iron deposits of Minnesota’s Mesabi Iron Range to the United States. The Ojibwe, however, retained the right to continue hunting, fishing and gathering in ceded lands. These rights were not given to the Ojibwe, but have always been retained by them: Treaty rights are property rights, rights that were never sold and that are common to all property owners. After a federal court decision (Voigt) recognized Ojibwe treaty rights in 1983, white sportsmen held sometimes-violent protests against Ojibwe off-reservation spearfishing. Anti-treaty groups accused the Ojibwe of destroying the fish and the local tourism economy, even though the tribes never took more than three percent of the fish. Riot police from around the state were deployed at northern lakes during the spring spearfishing seasons to help protect Ojibwe spearers and their families. At the height of the anti-Indian protests, Thompson sent his top advisor, James Klauser, a former chief lobbyist for Exxon’s proposed Crandon mine, to negotiate a buyout of Ojibwe treaty rights. Exxon, Noranda and other mining companies saw the treaties as obstacles to mining. Klauser was unable to persuade any of the six Ojibwe tribes to “lease” their treaty rights in exchange for money. But it was not the end of attempts to create the Crandon Mine. In 1969, the Flambeau deposit of copper, gold and silver was discovered near Ladysmith in Rusk County. In January 1991, the state granted a mining permit to Kennecott/Rio Tinto. While the Ojibwe and sport fishing groups had been in conflict over spearfishing treaty rights, they were united in opposition to the mine. Kermit Benson, speaking for the 6,000 members of the sport-fishing group Muskies Inc., warned that the mine would pose a threat to the fishery of the Flambeau River. Environmentalists with The Wisconsin Sierra Club joined the cause, and together with the Lac Courte Oreilles Ojibwe sued the state and won an injunction in July 1991 against further mine construction. They were able to show the mining permit was issued based upon a environmental impact statement that covered up the existence of several endangered species near the mine site. But when the DNR completed an amended statement remedying that problem, the injunction was lifted. The mine operated from 1993-1997 and then shut down, having quickly extracted the richest grades of ore. Lobbyists have cited this mine as proof that mining can be done safely in Wisconsin. But U.S. District Judge Barbara Crabb recently ruled that the Flambeau Mining Company violated the Clean Water Act on numerous counts. The Wisconsin DNR recently completed an investigation of water quality at the Flambeau Mine site and recommended that “Stream C,” a tributary of the Flambeau River into which Flambeau Mining Company has been discharging polluted runoff from the mine site since 1999, be included on its list of “impaired” waters for acute aquatic toxicity caused by copper and zinc. Other proposed mines — at the Lynne site in Oneida County near the Willow Flowage, and the Crandon site in Forest County — were defeated when the Lac du Flambeau and Mole Lake Ojibwe tribes formed alliances with environmental groups and other groups to oppose these projects. One of the critical turning points in the 28-year conflict over the Crandon mine occurred in 1995 when the U.S. EPA recognized the sovereign authority of the Mole Lake Ojibwe to regulate water quality on their reservation. The tribe’s wild rice beds were just a mile downstream from the proposed Crandon mine, and wild rice is a sacred plant for the Ojibwe and an important food source. The EPA decision meant that tribal regulatory authority would affect all industrial and municipal facilities upstream of a reservation, including the proposed mine. Wisconsin Attorney General James Doyle immediately sued the EPA and the tribe in federal court, demanding that the federal government reverse its decision recognizing the tribe’s right to set their own water quality standards, which may be stronger than Wisconsin’s standards. In April 1999, the U.S. District Court in Milwaukee dismissed the Wisconsin lawsuit and upheld the tribe’s right to establish water quality standards to protect its wild rice beds. The state appealed the decision. The Crandon Mining Company, a joint venture between Exxon and Rio Algom of Canada, joined the state’s suit as a “friend of the court.” Four townships downstream from the proposed mine signed on as “friends of the court” on the side of the EPA and the tribe. They put their trust in the tribe rather than the state of Wisconsin to protect the Wolf River watershed from mine pollution. In June 2002, the U.S. Supreme Court refused to hear Wisconsin’s appeal and let stand the lower court decision. In October 2003, the Mole Lake Ojibwe and Forest County Potawatomi tribal leaders announced that these two neighboring tribes had jointly purchased the 5,000-acre Crandon mine property and declared the area a conservation zone off limits to mining. During this same period, the Bad River Ojibwe demonstrated how the exercise of tribal sovereignty was essential to the protection not only of reservation resources but those of the entire Lake Superior watershed. In 1996 the Bad River Ogitchida (Protectors of the People) blockaded trains traveling through their reservation and supplying sulfuric acid to a copper mine in Michigan’s Upper Peninsula. The Ogitchida were concerned that a spill from tankers would poison their reservation water and the largest wild rice stand in the Great Lakes region. But they were equally concerned about the mining company’s proposal to inject 550 million gallons of acid into underground mine tunnels only five miles from Lake Superior. The Ogitchida won their demands for an inspection and repair of rail lines in Ojibwe territory and a full environmental assessment of the acid solution mine project. The blockade and the assertion of tribal sovereignty protected reservation resources and led the Copper Range Company to withdraw its application for underground acid injection at its White Pine copper mine. Once again, the Ojibwe acted to defend the environmental commons of the Lake Superior region. The iron deposits in the Penokee Hills of Ashland and Iron counties had been known about for more than a century, but were of a type — taconite — considered too low-grade to mine: the ore is only 15 to 30% iron. But the rise in iron prices since 2000 changed the picture and by 2010 Gogebic Taconite had become very interested in opening a mine. At one public hearing, Rep. Jeff Stone (R-Greendale) said that he doesn’t think it’s our job “to provide a seat at the table for the tribes.” In the mind of some Republican legislators, the tribes are just another interest group on this issue rather than a sovereign Indian nation within the boundaries of the state, as numerous court decisions have recognized. These legislators see the tribe as standing in the way of thousands of jobs proponents claim will be created by the mine. However, studies of mining communities by the late Dr. William Freudenburg, a sociologist at the UW-Madison, suggest that the highest levels of long-term poverty in the U.S. tend to be in former mining communities like Appalachia (coal), the Ozarks (lead), Michigan’s Upper Peninsula (iron and copper), and the former iron mining area around Hurley, Wisconsin and on Minnesota’s Mesabi Iron Range. According to Freudenburg, “roughly half of all published findings indicate negative economic outcomes in mining communities…there appears to be no scientific basis for accepting the widespread, ‘obvious’ assumption that mining will lead to economic improvement.” The Rural Sociological Society’s Task Force on Persistent Rural Poverty identified resource extraction not as an antidote to poverty, but a cause of it. If anything, the impact of mining on local economies has actually gotten worse: most competitive iron mines today are increasingly automated, requiring far fewer workers than in previous decades. In their efforts to portray the mine as an economic boon for a depressed rural area, mining supporters have often ignored or belittled the existing economies of Native American communities. For example, a recent Associated Press story described a poverty-stricken tribe standing “in the path of a major effort to create new jobs in Wisconsin” and called the Bad River Casino “one of the state’s smallest.” There is no mention of the fact that the casino is the largest employer in Ashland County and through gaming compacts, contributes $100,000 annually to fund local services and economic development initiatives. The 16,000-acre complex of wetlands, woodlands and sand dunes that comprise the Kakagon /Bad River Sloughs provides food security (wild rice) for the Ojibwe, acts as a filter to provide clean drinking water to local communities and provides spawning habitat for lake sturgeon and other species in Lake Superior. The Ramsar Convention on Wetlands, an intergovernmental treaty ratified by the United States, has designated the Kakagon/Bad River Sloughs a “wetland of international importance.” The jobs created by this ecosystem are more numerous and more long-term than any jobs provided by a boom-bust mining economy. These wetlands had previously been protected by the Wisconsin DNR as “Areas of Significant Natural Resource Interest” because of their direct hydrological connection to areas and waterways with a special designation, such as trout streams and Lake Superior. Development in these areas was severely restricted. Wisconsin tribes have asked that any change in Wisconsin’s mining laws should include provisions to require the DNR to fully consult with and fully consider the impacts of their decisions on the tribes. This would require that the principles of “environmental justice,” affirmed by President Clinton in Executive Order 12898 in 1994, are followed by the State of Wisconsin so Indian communities are not forced to suffer the most harmful effects of mining projects. The Ojibwe also emphasized that any new mine legislation should be based on sound scientific and legal principles, for instance, that it should exclude any project that has the potential to cause acid mine drainage. None of the tribe’s 10 principles were considered in drafting the iron mining bill. Governor Walker’s only response to the tribe’s concerns was that he heard what they had to say. Wiggins fears the sulfide minerals in both the ore and waste rock could release sulfates that would destroy their wild rice while increased mercury loadings would result in fish consumption advisories in an environment already at risk from mercury contamination from past and present iron and copper mining. According to the Lake Superior Binational Program, taconite mining is already the largest source of mercury emissions in the Lake Superior basin. There is no suitable technology to curtail these emissions. Wiggins had good cause for such a serious charge. Phase 1 of the open pit mine envisioned by Gogebic would be 4 miles long by l.5 miles wide and 1000 feet deep. It would be the world’s largest open pit taconite mine, dwarfing even the Hull Rust Mahoning Mine in Hibbing, Minnesota, currently considered the biggest. Gogebic lobbyist Bob Seitz criticized Bjornerud’s findings because she didn’t have access to proprietary data on core samples held by the company. But the company refuses to release this to the public. In Minnesota, sulfate releases from iron ore waste rock has resulted in a wild rice dead zone for 100 miles downstream from the Mesabi Iron Range in the St. Louis River watershed. Elevated sulfate releases have also been shown to change mercury into methyl mercury, which can accumulate in fish tissue and is toxic to those who eat the fish. Bill Williams denies that sulfide minerals in the deposit will cause any environmental problems. And if they do, Williams told a reporter that his company would “engineer a solution to ensure that tainted waters don’t harm groundwater or the watershed, including the Bad River Reservation.” But the industry has been unable to provide a single example of where the mining of sulfide minerals has not caused surface and groundwater pollution. To protect their wild rice beds the tribe has asserted their sovereign authority under the Clean Water Act to enforce tribal water quality standards on its reservation. Any polluted waters flowing from the Penokee Hills open pit mine and waste piles into the Bad River watershed and the tribe’s wild rice beds is subject to tribal water quality standards enforced by the EPA. Just as the Mole Lake Ojibwe’s assertion of tribal sovereignty served as a rallying point for all those concerned with protection of the Wolf River watershed, the Bad River Ojibwe’s assertion of tribal sovereignty has served to bring together Indians, environmental and sport fishing groups as well as local elected officials into a broad movement for watershed protection. “From just north of the Penokee Mountain area to Lake Superior,” says Mike Wiggins, Jr., “our tribe is ready to stand up and protect Nibi (water) for all peoples and future generations.” Gogebic and state officials who support its mine are in for a long, hard fight over this issue. Al Gedicks is emeritus professor of sociology at UW-La Crosse and a longtime environmental and indigenous rights activist and scholar. 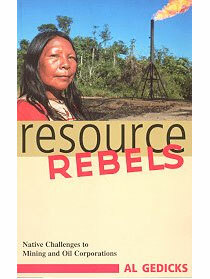 He is the author of “Resource Rebels: Native Challenges to Mining and Oil Corporations” (South End Press, 2001). Then we need to start ban all casinos and quit giving the Indians everything they want. Make them start working for a living for once. They don’t obey there treaty. They take everything for granted and act like we owe them something. We don’t owe them crap. Tired of the Indians always getting what they want. We all need to ban the casinos and really make them work for there money instead of getting a free check each month for doing nothing. Don’t know why they think we owe them everything and they think they own this state. Might as well give up fishing because a person off the reservation can only keep a couple of walleyes while they kill our lakes of fish. We pay for our fishing and boat registration to fish and they don’t. What’s wrong with this government, this is why this country is all screwed up. We always give to other nationalities and we don’t get nothing back except getting screwed. Thank you for the very informative update, Al. I am fond of wild rice and I am concerned this important food source of the Ojibwe is in such peril, not only as a primary dietary source but also as a commodity for them to market. I had forgotten about President Clinton’s Executive Order 12898 on the principles of “environmental justice.” May I quote you from your powerful article? I will be very meticulous in citing your writings as the source.